On September 30, a referendum was held in the Former Yugoslav Republic of Macedonia (FYROM) for voting the country's EU-NATO membership in terms of the Prespa Accord, in which governments of Greece and FYROM had arrived into an agreement by deciding to change the FYROM's name to "Republic of North Macedonia". While a participation of at least 50% was necessary for the referendum to be legally valid according to the FYROM Constitution, less than 37% of the 1,8 million eligible voters took to the polls on last Sunday. On October 1, the Communist Party of Greece (KKE) issued a press statement on the referendum results in the FYROM. Despite the international pressure - including the presence of NATO, USA and EU officials in the country - for the approval of the Prespa Accord, the KKE stated that the low participation demonstrated that a section of the people in the FYROM holds a negative - or at least "cautious" - stance towards the "blackmail declaring that integration into these alliances - that are enemies of the peoples - is the only way." For the KKE, another point that the results raised was the sharpening inter-imperialist contradictions and the intervention of nationalist forces. The KKE put forward that the SYRIZA-ANEL government - "as NATO's flag-bearer" - had been exposed for promoting this blackmail and added that Prime Minister Zoran Zaev's intention to reverse the results of a referendum that are not to the liking of the imperialist centres reminds of the attitude of his Greek counterpart Alexis Tsipras after the referendum on Troika memorandum. "It is obvious that in the coming period the pressure towards the two peoples to accept the Accord will continue in order to advance Euro-Atlantic integration into the Western Balkans. The competitions between the powerful forces that are transforming the wider region into a gunpowder warehouse will continue and intensify. 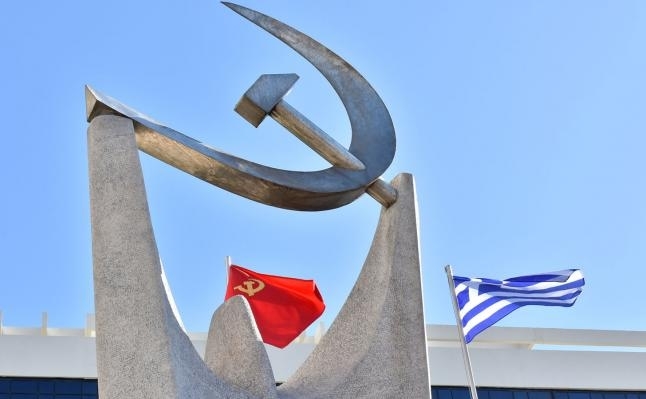 The KKE calls upon the Greek people and the people of FYROM to forge their common struggle, in solidarity and genuine internationalism, against nationalism and imperialism, against NATO and the EU, their governments and parties. On these grounds a mutually acceptable solution can be found, leaving out all phenomena of irredentism, with a composite name, with a geographical designation."